Hello. Hope you are well dear blog readers. Unfortunately I seem to have a head made of concrete as I have a cold and it’s gone straight to my sinuses. Just taking a little longer to get out of bed than normal but will be there soon! 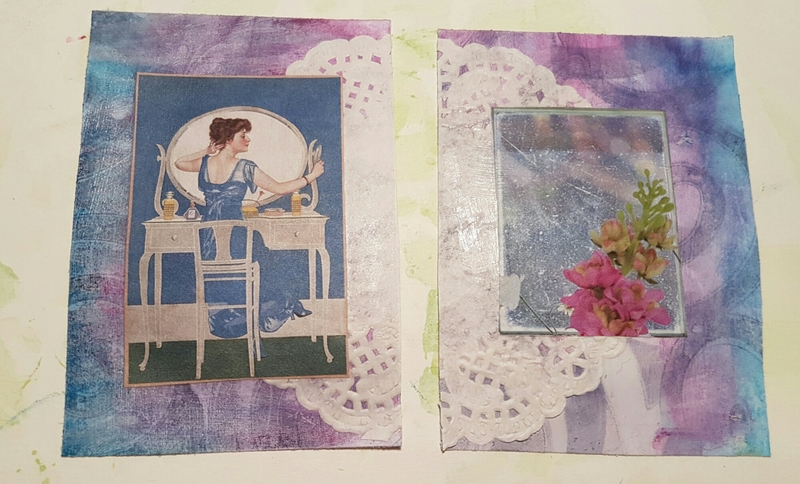 In the meantime I have two more ATC’S to share in my year long challenge of 365 in the year. 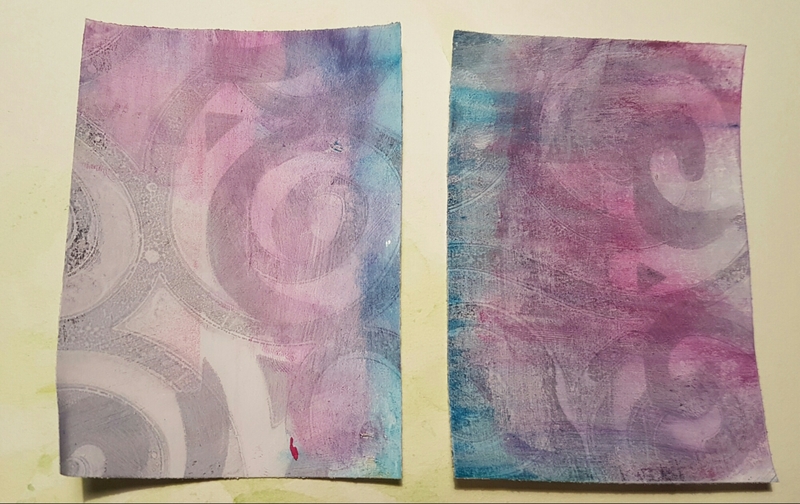 These are two Gelli prints that I made ages ago and then cut up for using in this project. I realised I needed some gesso on them to add some tooth to work with as I wanted to add distress crayons to add some more colour to them. I added some pink and blue to keep to the colour scheme of the purple in the background. 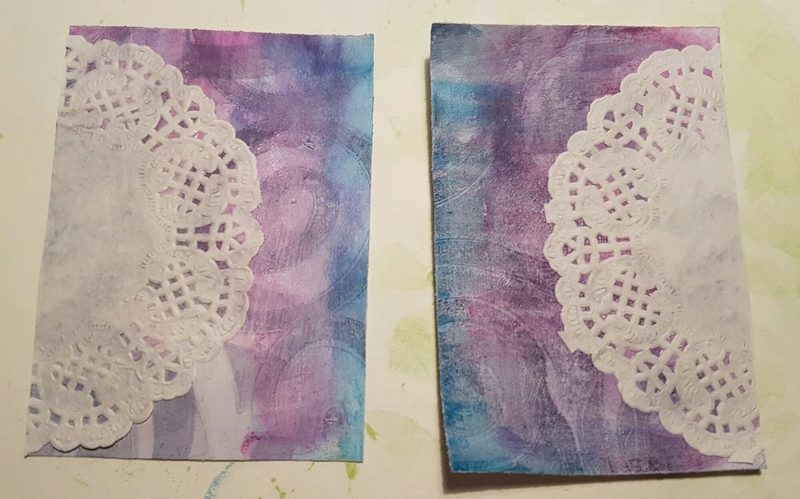 Next I added a doily cut up to be able of add to each of them. I love the pretty texture a doily brings to a project. 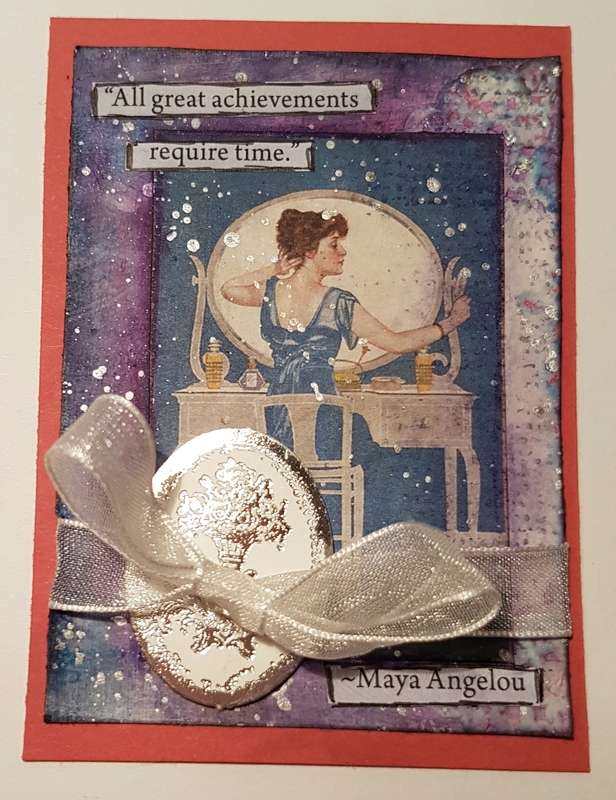 I then had a hunt through my odds and ends embellishments box and found some pictures I wanted to add. 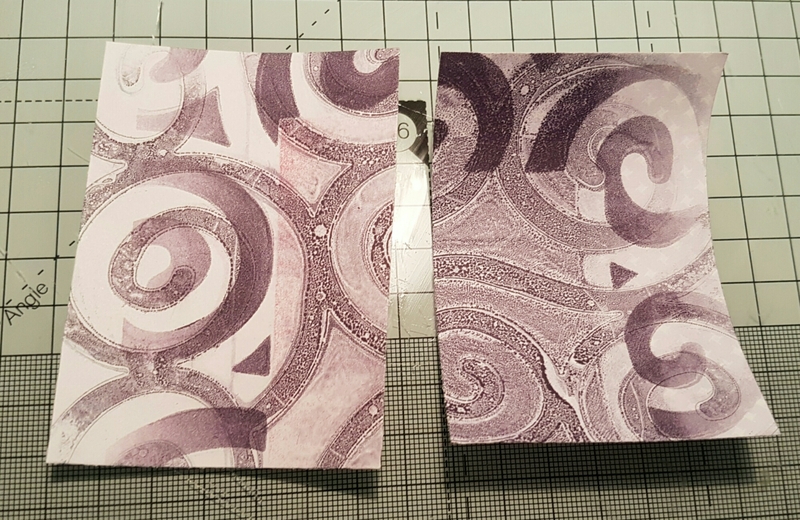 The one on the left has come from a book of “pretty” elements that a friend gave me … perfect for this sort of project. 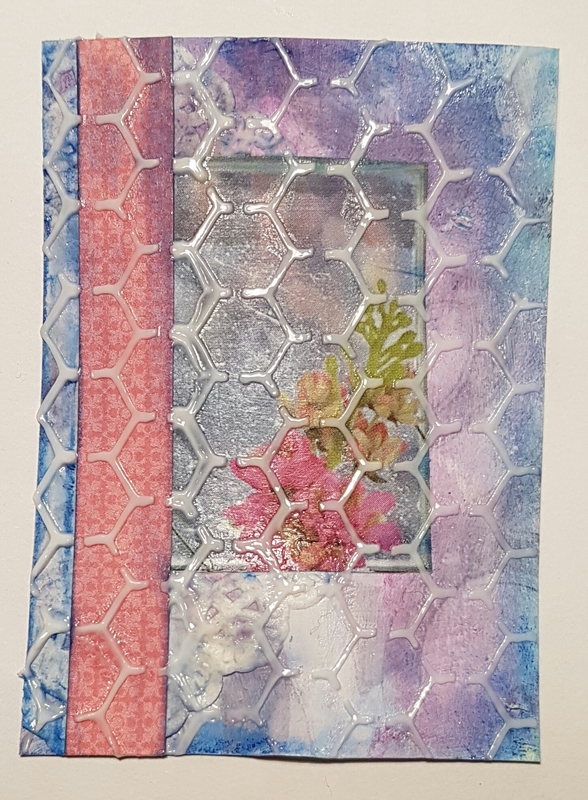 the one on the right is cut from a magazine and I thought it was perfect colours for the ATC so on it went! So then I stopped trying to keep them similar! I trimmed down the left hand one a bit and flicked silver paint onto it and edged it with some ink. I also stamped around the edge with the Timeless textures flourish and some Perfect Plum ink. Then I used an Inktense pencil and some water to outline the image and frame it. I unfortunately then flooded the paper with water as I pressed the spray bottle in he wrong way and the lid came off! oops! Once it had dried out I added the sentiment, a little embellishment and an organza ribbon to the topper. Then mounted it onto a pink base. Onto the other one. 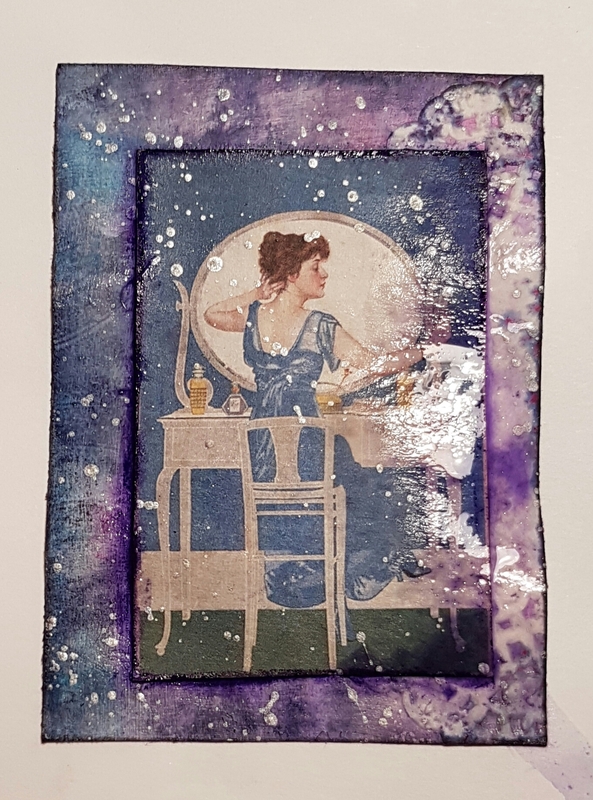 I added some Inktense, a piece of pink cardstock and then some transparent glossy texture paste through a stencil. Once this was dry I could add more colour by using distress inks and a blending tool. 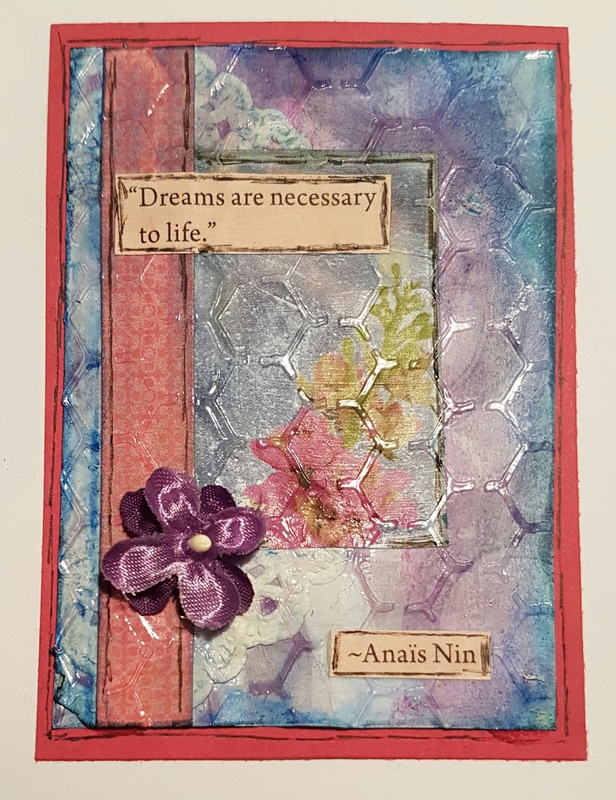 Again I found this quote and added this and flower to the card.. then trimmed it down a little and added some doodling and mounted it on pink card like the other one. Love how these two came together and both look similar but different at the same time!